The fool’s gold shimmering below was the last thing I noticed before the inflatable raft descended into Satan’s Cesspool. “Lean in,” the guide yelled as a wall of water came crashing down. 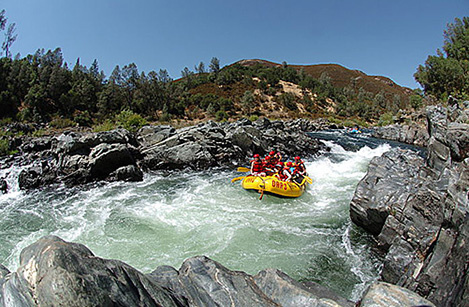 We were rafting theSouth Fork of the American River, Northern California’s most user-friendly rapids. Teens, grandparents and people I never would have pegged as campers (let alone rafters) were drenched and seemingly giddy to be in Gold Country’s speck of a town called Lotus in El Dorado County. This wasn’t always the case. Just a stone’s throw from Coloma – where James Marshall first exclaimed “Eureka” and spawned the largest migration westward since, well, maybe ever – Lotus has slowly crafted a niche for adventurers who descend into this wooded community each summer to take advantage of one of California’s most dependable rivers. Catering to the deluge of outdoorsy types, Lotus features a couple affordable restaurants and pubs and sandy beaches, as well as proximity to wineries specializing in big reds at killer prices. If you miss real summers and are aching for a warm weather outdoor adventure, the time is now to experience the best of Lotus. Why now? For me the draw was sweltering temperatures ideal for cooling off in the river and warm nights of sleeping under the stars. Others will appreciate that the South Fork of the American River is open for rafting six days a week through October, something other rivers in California cannot boast. Backstory: The water levels of the American River vary year to year. Finally, the folks at Sacramento Municipal Utility District and PG&E got together and began a water release program from their main dams. Today, the experienced rafting guides know precisely when the rush of water will be released that day, and they can take advantage of riding this wave. Because these are the only Class III rapids in the state that flow with such reliability and Class III is the highest classification for first-time rafters, Lotus’ businesses are cashing in on travelers from around the globe by offering more than the typical dusty Gold Country vibe many Bay Area people associate with the Sierra foothills. Checking in: The new OARS campground is particularly lovely for the whole family, including a collection of raised canvas tents with beds and free tent sites for rafters. For those who prefer a duvet and a four-poster bed, the nearby Coloma Country Inn provides thoughtful antique-decorated rooms and cottages along the river that would make Martha Stewart drool. Spend your day: A summer day in Lotus is all about the river. OARS is one of the more venerable companies, albeit one of the more expensive outfitters. One-day trips last about six hours, including lunch and enough time to leisurely float along the oak and conifer-dotted shore, passing river otters. Midday the crew set up an organic, no-waste picnic lunch of sandwiches, fresh fruit, chips, water and cookies, allowing us an hour or so to sit in the shade and relax before heading out to what our guide called the reason he started rafting. Our flotilla of rafts passed kids, dogs and even a crew of blind people paddling toward the famed Hospital Bar rapids. Our guide was right: the last hour of the trip invited us to hold on tight as we ping-ponged through the gorge, slaloming around rocks and making me itch for more adventure. 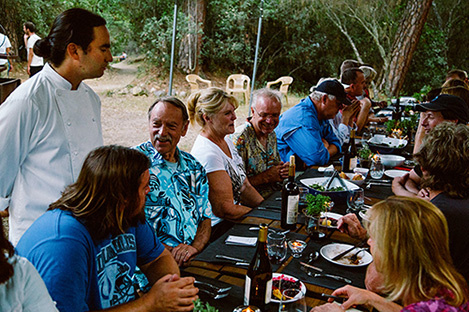 I signed up for OARS’s Fork, Cork and Paddle package, which included a wine reception and a farm dinner in the campsite. Live music resonated in the warm summer air as I ate a salad sourced from only a few miles away and chatted up a sunburned couple from Los Angeles who had never been rafting but couldn’t stop smiling. Dining: While Lotus houses the upscale Cafe Mahjaic, Marco’s Cafe is where the locals gather. Brews along the water, Roman-style pizzas, hearty spinach salads, international rice bowls and a thick slice of a well-deserved brownie for dessert make this alfresco riverfront joint a favorite for guides and travelers. Don’t miss: As you wind along the leisurely mountain roads toward Placerville, pop into the Lava Cap Winery for a complimentary sampling of their American River Red and aromatic Barbera. Don’t bother: Picking up those flecks of gold in the American River: It is not called fool’s gold for nothing. Word to the wise: It’s hot out here in summer, and the markets jack up their prices. Buy jugs of water and camping snacks in advance.